The Bateleur (named for the bateleur eagle) is an unmanned aerial vehicle (UAV) prototype designed and built by Denel Dynamics (formerly Kentron). It has been designed as a MALE (medium-altitude - long endurance) UAV, with its primary role being surveillance, with a secondary signals intelligence capability. Development began in 2003 as a totally in-house and private-venture project, being developed with internal company funds. The first prototype was expected to fly in early 2006 but as of 2010 this has not yet happened. The aircraft was included in a Brazilian Air Force RFP for UAVs in early 2009, though as of 2010 the competition has not been concluded. The South African National Defence Force (SANDF) has expressed interest in the system, but requested in 2006 that the cost of the system be reduced before an acquisition could be considered. In 2008, the South African Air Force announced a project, named Itambo, to acquire a MALE UAV in the 2008-2012 timeframe, with the Bateleur presumed to be a front-runner. The entire aircraft is constructed using a modular construction system, making future adaptations of the airframe for increased range or larger payloads simpler than would be possible with a rigid airframe. It also makes it possible for the aircraft, once disassembled, to fit inside a 6 m ISO shipping container. It is able to carry a variety of payloads, with a maximum payload mass of 200 kg (440 lb). Initially, proposed payloads include the Denel Optronics Argos-410 electro-optical (E/O) and infrared (IR) system (with optional laser rangefinder), the Denel Optronics Goshawk-350 E/O and IR system (also with optional laser rangefinder), a laser designator, an Avitronics Emitter Locating System, electronic intelligence equipment, and/or a synthetic aperture radar. Though at present it has a maximum "action radius" of only 750 km (470 mi), a Ku-band satellite datalink was proposed which will allow the Bateleur to extend its range to around 3 500 km (2 175 miles), making it suitable for missions requiring longer ranges such as maritime patrol. The Bateleur takes off and lands conventionally, on a runway, and has retractable undercarriage. It is also completely autonomous, allowing it to take off, conduct its mission, and land all without human control being required. ↑ Defence Talk editor. 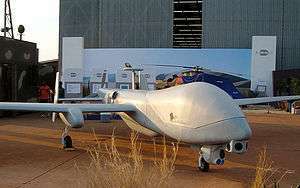 Denel MALE UAV on First Overseas Visit. Defence Talk, 29 November 2005. Retrieved on 7 March 2010. Wikimedia Commons has media related to Denel Dynamics Bateleur.